I've been looking forward to this book for quite a while now. Why? It was the first fantasy that I had ever seen that was set in an Arabian-style world, as opposed to yet another generic pseudo-Medieval, pseudo-European excuse for lazy writing. It meant different customs, different kinds of heroes and heroines. And I was really in need of a change. 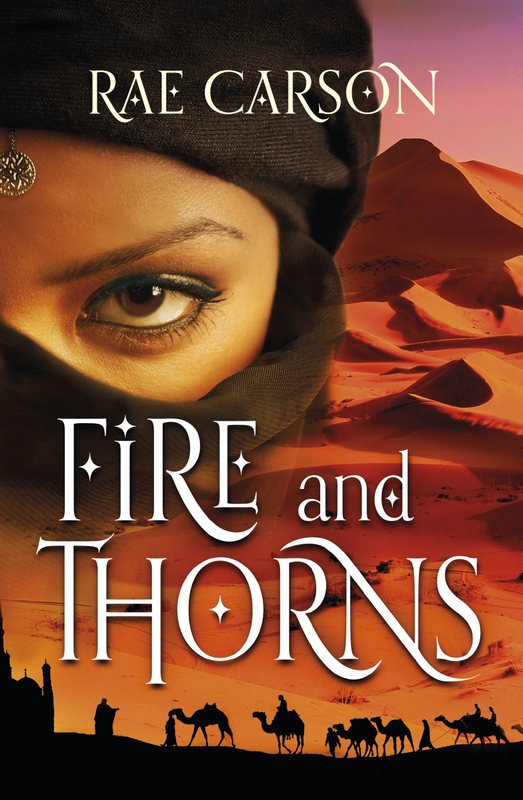 Fire and Thorns is the first book in a trilogy of the same name, in which we follow the adventures of Princess Elisa. She lives in a world where once every century, God bestows upon someone a Godstone, a living jewel in their navel, that acts as a sign that they have been chosen for an act of great heroism and faith. Elisa is the current bearer of the Godstone, and at sixteen she has done little to prove that she is worthy of God's faith. She does little but pray and study ancient texts, and her crippling feelings of inferiority regarding her own abilities expresses itself through comfort eating. The first scene in the book is her ripping her hastily sewn wedding dress through bulk alone. She only feels worse when she is given away in political marriage to a man who won't even acknowledge her as his wife in his home country. But she finds that her time of service is much closer at hand than she ever imagined, and that she is in possession of greater strengths than she ever dreamed. There is something incredibly comforting about having the main protagonist be an obese teenage girl. Not only is the humiliation of not fitting into your own clothes realised here in uncomfortably familiar detail, but it actually addresses something that you don't really see in much fiction. Fat people very rarely being the main protagonist, or in the main cast at all, and all that jazz. It confronts a weird social perception that people seem to make between weight/body shape and skill/intelligence. When Elisa starts the book, she is treated with condescension, with people more impressed than should really be warranted when they realise that she has an incredibly sharp academic and strategic mind. She has spent her entire life learning about classical texts, including texts on military strategy, and yet they're surprised by the evidence that is presented to them. Because of events in the text that I shan't spoil, she slims down quite drastically by the end. At which point she is suddenly everybody's favourite person and taken much more seriously. Admittedly, her actions up to that point must have had some impact, but maybe not quite so drastic. I guess I was just really charmed by Elisa, who really comes into her own over the course of the narrative, though I did feel somewhat predisposed towards liking her. The plot is pretty cool, with a nice mix of political intrigue, adventure, quest and even a little bit of romance. It's pretty slow in the first part, where it's mainly courtly intrigue, but that has never really been much of an issue for me. I love courtly intrigue, so I was loving it. The second part ups the pace a fair bit and moves away from the intrigue and more towards the adventure and military sort of aspects. It took me a bit longer to warm to this bit, but still enjoyable. The romance was the most obviously weak part of the narrative. There are two main love interests, but neither go anywhere. The first is her much older husband Alejandro, which, given that she's sixteen, puts him maybe in his 30s or 40s. Either way, he's incredibly beautiful and charming, but initially has no interest in her and is pretty spineless. The second is a comrade that she meets in the second part, who seems to love her almost from the start, despite his friends' doubt in her. He's pretty sweet. Neither go anywhere and the endings of both romantic sub-plots is pretty swift and brutal. More realistic I guess, but at the same time just a tad bit confusing. My gut wants a romance sub-plot to be realistic-ish, but with an ultimately happy ending. Fire and Thorns sort of started the sub-plots, then did take-backsies and I don't know how to feel about it. In either case, the romance aspects seemed more rushed than other parts of the narrative even when they were there, so I wasn't too gutted when they were abruptly cut off. The fantasy elements were really cool. The way that the Godstone instinctively acts towards friendly and not-so-friendly intentions, the way that Elisa can activate it through prayer, the further-reaching consequences of previous bearers' Godstones now that they aren't part of a living body. The main enemy of the narrative, the Inviernos, were kind of interesting, but not really explored much. I wanted to know more about them, what they wanted, how they lived and such. But nope. All we got was "they're pale and burn people with evil blood magic." Kind of took a page from Dragon Age there, huh? Maybe more will turn up in the following books, but it would have been nice to get a little bit more concrete info than "they're evil, run with it".